Here are a pair of cakes for Parashat Vayeshev. 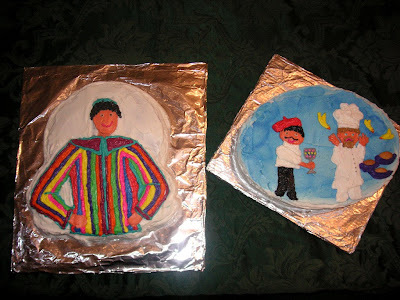 One is of Joseph in his Coat of Many Colors, and the other depicts Joseph's cell-mates' dreams: the wine steward with his accepted wine goblet, and the baker with the birds attacking three loaves of bread. I made Joseph from a cake baked in a Batman pan. That's why his head is all out of proportion to his body. Underneath all that Amazing Technicolor Frosting, our man Joseph sports rippling biceps, abs to envy, and a very well equiped toolbelt. 1 comments, so far. Add yours now! i love your parasha cakes. such a great idea. and such a talent!!! I've conquered an obsession. Well, sort of.